This is an Op-Ed submitted by Ray Duncombe. 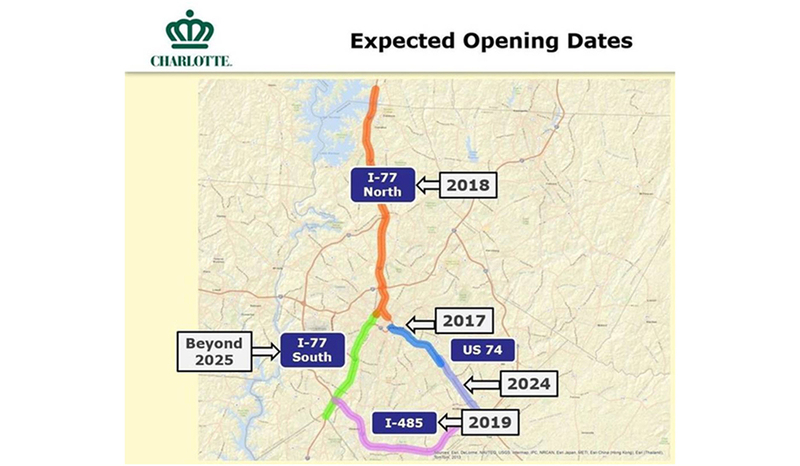 Maybe you’ve caught a quick sound bite on the news, or a headline on a website saying something about tolls coming to I-77 in North Charlotte and wondered what the big deal is? The coverage that most people see is so short and vague that it’s hard to understand why anyone is bent out of shape about the idea. 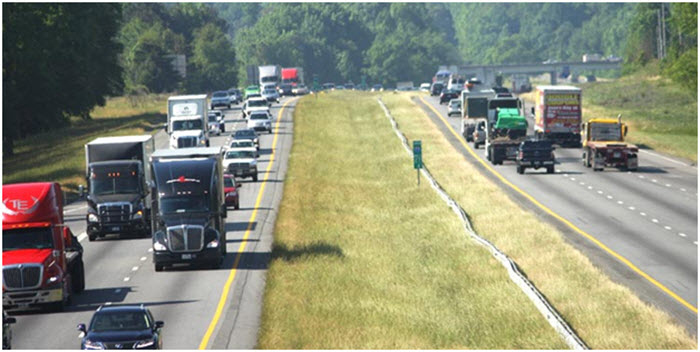 So why should you care if toll lanes start sprouting like weeds around Charlotte? 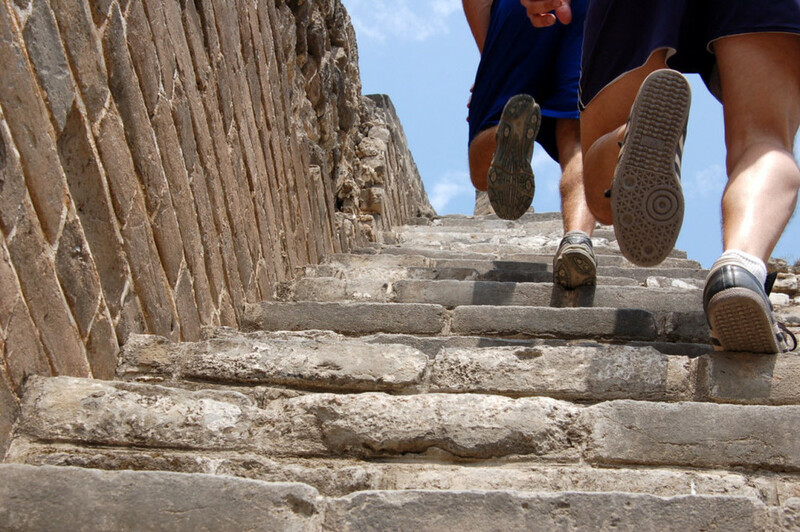 Here are 10 reasons you should start caring today. Most people understand how toll roads work. You pay a set fee to drive a certain distance and you get off it when you want to. What is planned for I-77 is nothing like that. What will be built on I-77 will be two separate lanes with limited entrances/exits with pricing based on how bad the traffic in the free lanes are at that moment. Driving back from Davidson at 3 am? The toll lanes will be dirt cheap because the highway is empty and there is no reason to use the toll lane. Want to drive to Davidson at 5:30 pm on a Friday afternoon when everyone is either going home or to the lake? That will cost you considerably more. Tolls are estimated to be over $10 one way during “peak” hours with no cap on how high they can go. Plus there is no way to know what the cost will be until you are on the highway, as they will change every five minutes. When a wreck happens in the free lanes, you can bet the price for the toll lanes will skyrocket within minutes as people try to go around it. Wait, what? Why else would you build roads? 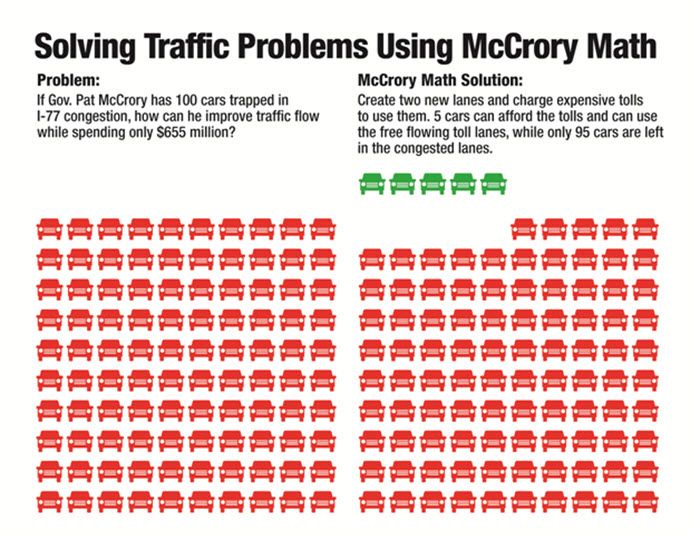 Well, the NCDOT has publicly stated that reducing congestion isn’t one of the reasons to build toll lanes. 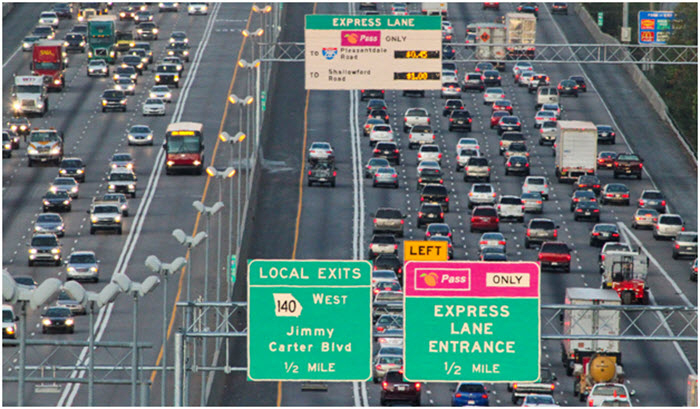 Paradoxically, toll lanes rely on congestion on the free lanes to make money. If there isn’t stopped traffic, why would anyone use the toll lanes? Unfortunately, across the country toll lanes have shown to only carry 6-20% of the traffic carried by free lanes because most people aren’t willing or able to pay the fees. (3) Carpools are still free though, right? That underused 2 passenger HOV lane on the left side of I-77 that always seems empty? That’s going away and being turned into a toll lane that you have to pay for. But in exchange, you can now use the toll lane for free if you have 3 people in the car. Great deal right? What no one seems to be mentioning is that you still have to buy a transponder to put in your car that will tell the toll operator that you are a registered carpool. You could be driving a clown car with 12 of your closest buddies crammed in with you and you’ll still be charged a toll without the right transponder. Cars passing through from other states with 3+ people are out of luck, because even if they have a transponder (like an EZ Pass or a Sun Pass) they’ll still pay tolls because they don’t have any way to indicate how many people are in the car. 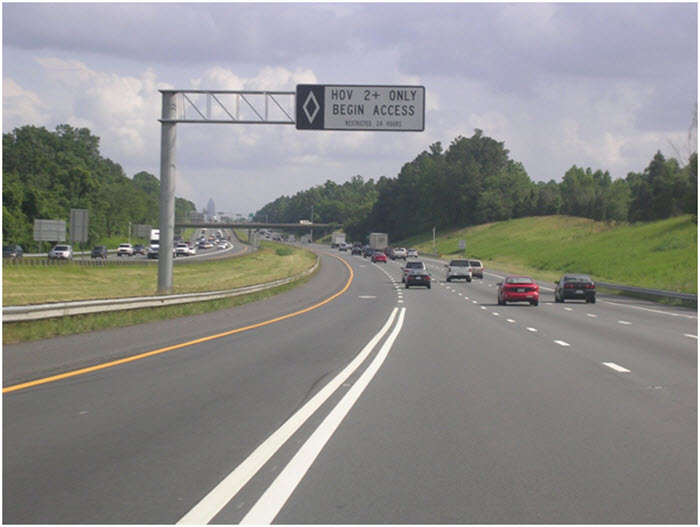 The NCDOT keeps saying that they’re going to get lanes cheaper than if they built the lanes themselves, but are they? The total project cost is estimated at $655 million, with the NCDOT only paying $95 million up front. Comparable free lanes from miles 20 to 28 where the congestion exists are estimated to cost $120 million. Sounds cheaper, right? Instead of taking that extra cash to build other needed road projects, it is being used to increase the cost of the toll lanes project. Only in Charlotte can politicians not even take bribes correctly. But it gets worse. If the toll operator doesn’t take in enough toll revenue to pay their debt and expenses, the state is on the hook to give them an extra $75 million. The real kicker is that when the toll operator decides that they can’t make enough money running the toll lanes, North Carolina is on the hook to pay 80% of the outstanding debt of the toll lanes. That debt will remain over $300 million for the first 15 years of the project. So instead of “only” costing us $95 million, the likely cost of the toll lanes is going to be much closer to $487 million, and that is before you count a single penny paid by drivers who use the toll lane. Even using Common Core math that makes $120 million to build free lanes seem like a bargain. Why should you worry about the debt that the toll lane operator has? Well, the top three revenue generating toll lane projects in the USA are in LA, Miami and Houston. They take in $41, $15, and $9 million in toll revenue a year respectively. In the first year of operation the I-77 toll lanes would need to take in $34 million (!!!) just to break even. In the second year, that number climbs to $41 million. Last I checked the Lake Norman region was not exactly comparable to LA. There just aren’t enough drivers here to shell out over $40 million a year on tolls. I-77 has the highest truck density per mile of any highway in North Carolina, and the toll lanes are being built so that trucks can’t use them. So all of those trucks that just want to pass through Charlotte or go to the new intermodal freight facility at the airport are going to be stuck in the existing lanes. Trucks clogging up the free lanes will increase congestion and discourage businesses from wanting to locate where the toll lanes exist. Why have a business there when there are beautiful free highways in Concord or Fort Mill? Not only is the state refusing to build additional free lanes today, they’ve signed a contract that will make it very hard to do so in the future. First, they are using up all of the right of way land they own today for the toll lanes, so if they wanted to expand in the future they would need buy the land next to the existing lanes. Then they agreed to a contract where they’d actually have to pay Cintra damages for reducing their toll revenue by reducing congestion. We pay the highest gas taxes in the Southeast, we’d need to buy more right-of-way, pay for highway construction costs, and then we’d still need to pay a penalty to a foreign company to expand our own highway. Brilliant! Anyone who has driven through heavy congestion knows the worst part is where you merge. Some drivers are inconsiderate and force their way in, while others seem to let every car ahead of them. Today with only two free lanes on I-77 the traffic slows down considerably every time you approach an on/off ramp. 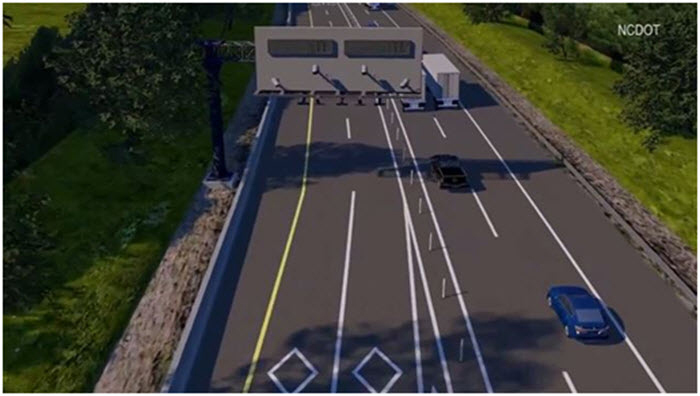 To get on the toll lanes, drivers will need to merge onto the slow moving free lanes, navigate to the left lane, and then enter the toll lane at dedicated on/off merger points. 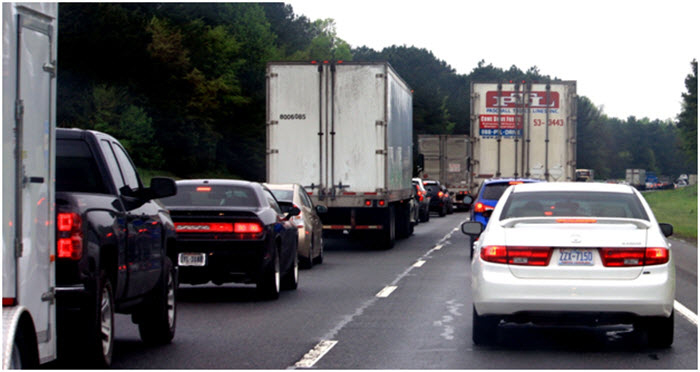 When they want to get back off, they will have to slow down, merge into the slow moving traffic, and sit in the slow moving traffic until they get to their exit. Somehow I don’t see the people that have been stuck in slow moving I-77 traffic being willing to let people from the toll lanes easily merge back onto the free lanes, do you? Traffic on the free lanes will only get slower as drivers will need to deal with traffic merging on and off from both the right and left hand lanes. I could say the fee will be “up to $1 trillion” and be just as accurate, as the actual fee will likely be much, much less. The contract has pages worth of conditions and qualifiers that will be triggered if the contract is cancelled, but as there hasn’t been a single shovel of dirt moved yet, it would take some very creative accounting to justify $100 million worth of work. If the contract is declared invalid for legal or ethical reasons, then there wouldn’t be any fee due at all. Not only would Charlotte area drivers be paying tolls to use a road that should have been widened 15 years ago, but the fees will be leaving the country. That is money that could have been used at local restaurants, bars, stores, or services. 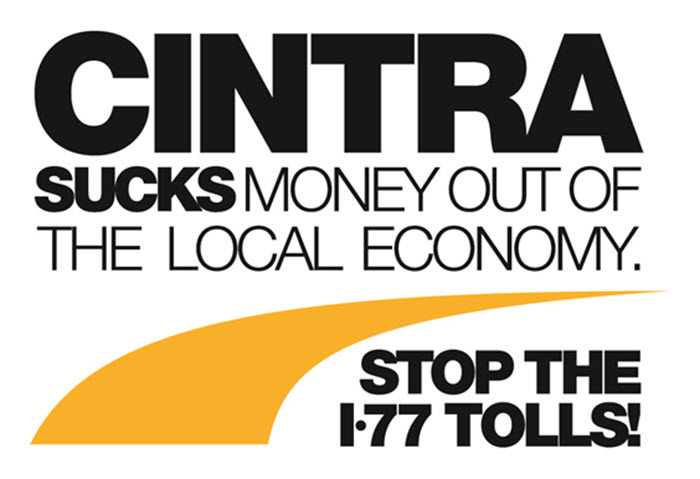 If you want to learn more about the I-77 toll lane plan and what you can do to help stop it, visit wideni77.org or “like” Widen I77 on Facebook.